A data-driven test (a.k.a. parameterized test) is a test designed to accept one or more parameters that are used in the test. It is expected that the test will be run multiple times and each iteration will be provided different values for the parameters. The parameters are typically used to vary the user inputs and to check the output. Even if a test will not be used with multiple input/output values, parameterizing a test also serves to document what user inputs go into the workflow and what values are expected as output from the system. 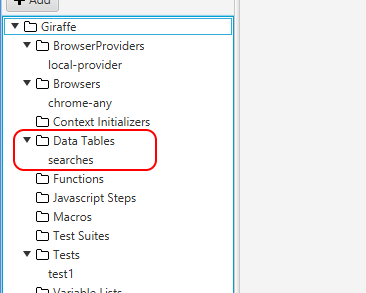 After this change, the test will lookup variables named search_term and expected_page_title and use them in the user input and page title verification steps. Now when the test runs, these values will be injected into variables that can be accessed in test steps. Try running the test. If you examine the event log, you will find events as the variables are set at the beginning of the test and as the variables are resolved when steps reference them. Note that the first row contains column names while the remaining rows contain data. The column names I used match the parameter names expected by the test. Put the CSV file into the project folder and then restart MuseIDE so that it will recognize the new project resource. The first row of the CSV file is used as column names. The remaining rows are considered data to be used in tests. As rows are used by a parameterized test suite, a set of variables is created from each row. The name of the variable is the column name; the value is the value of that column from the current row. The last step is to create a parameterized test suite. This combines a test with a data table - running the test once with each row of data in the table. Variables injected from a parameterized test suite override the default values for those variables that are configured in the test. 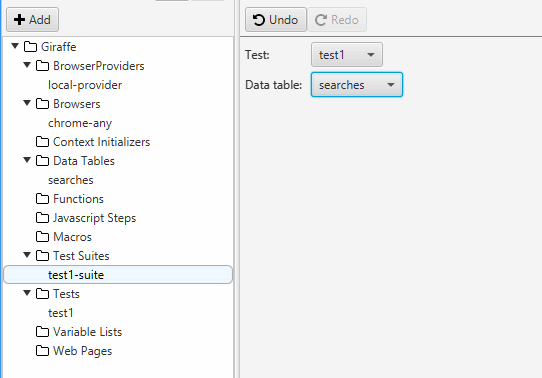 Here I created a parameterized test suite named test1-suite and configured it to run test test1 with values from the searches data table. MuseIDE cannot currently execute a parameterized suite — you must use the Muse command-line tools to run the test (shown below) or run them in your CI server.